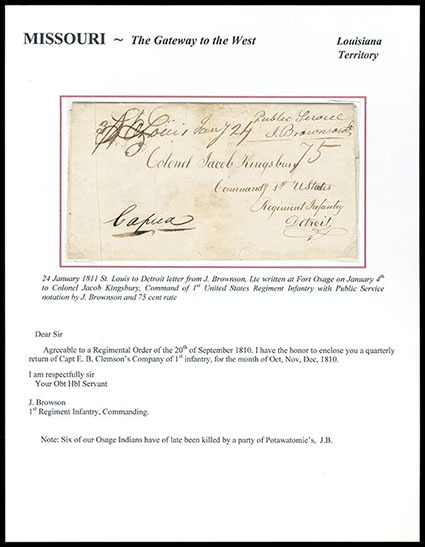 (Louisiana Territory) "Cannon Mines 19th Septm. 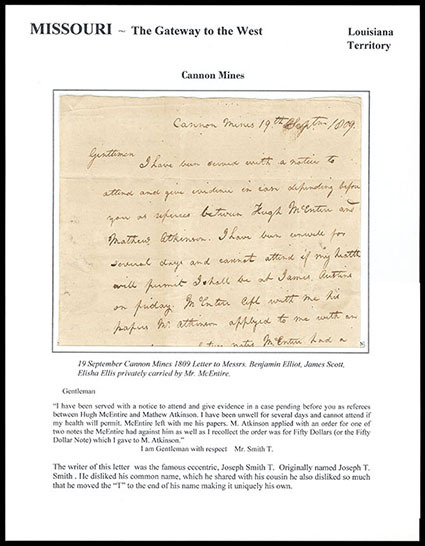 1809", dateline on folded letter addressed to Messrs. Benjamin Elliott, James Scott and Elisha Ellis, carried privately by "Mr. McEntire" as Cannon Mines did not have a post office, letter by Smith T. concerning a pending case; some toning and file fold, Fine, ex-Alexander. 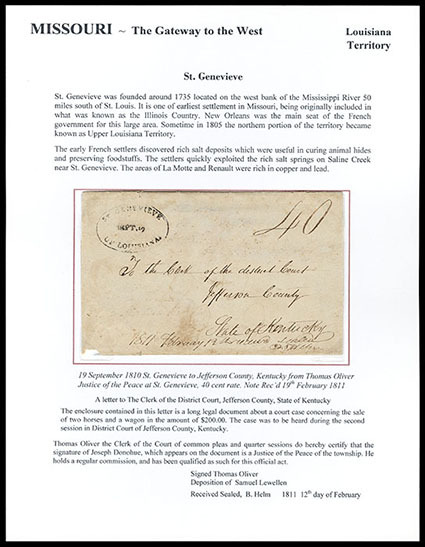 (Louisiana Territory) St. Genevieve, Up. Louisiana. Sept, 19, oval postmark and manuscript "40" rating on 1810 folded letter as a double letter sheet at 20¢ per sheet for over 300 miles to Jefferson County, Kentucky, legal letter from Justice of the Peace Thomas Oliver to the District Court Clerk about a court case concerning the $200 sale of two horses and a wagon, original 1810 enclosure datelined "Territory of Louisiana, District of St. Genevieve,"; some reinforced edge splitting, Very Fine, ex-Risvold. A CHOICE STRIKE OF THE RARE ST. GENEVIEVE, LOUISIANA TERRITORY OVAL. St. Genevieve was founded around 1735 located on the west bank of the Mississippi River 50 miles south of St. Louis. It is one of the earliest settlements in Missouri, being originally included in what is known as the Illinois Country. New Orleans was the main seat of the French government for this area. Sometime in 1805, the other portion of the territory became known as Upper Louisiana Territory. (Louisiana Territory) "St. Louis July 15. 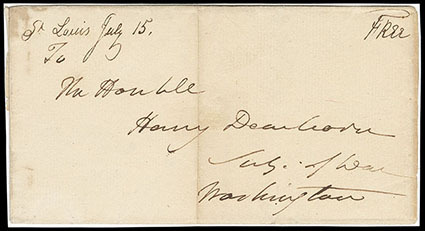 ", manuscript postmark and matching "Free" rating on 1806 folded cover to Hon. Henry Dearborn, Secretary of War, Washington D.C., docketed as containing a $600 draft from Governor Gen. James Wilkinson; file fold and some edge toning, Very Fine and early territorial use. 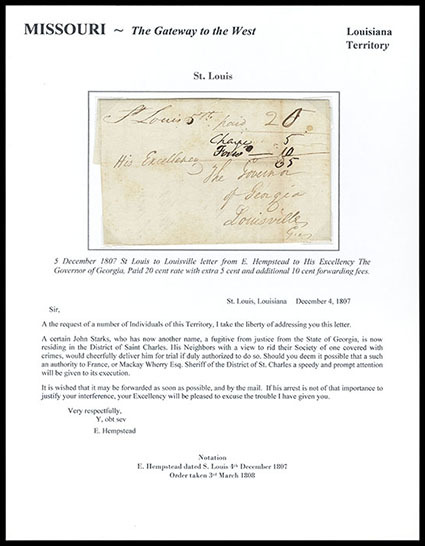 (Louisiana Territory) "St. Louis 5th", manuscript postmark with "Paid 25" rating updated to "20" on folded letter to the Governor of Georgia at Louisville Ga., forwarded with "Charge 5" and "Forwd - 10" ratings totaled to "35" cents giving no credit for prepayment, interesting letter datelined "St. Louis, Louisiana December 4, 1807" and reading "…At the request of a number of individuals of this Territory, I take the liberty of address you this letter. A certain John Starks, who has now another name, a fugitive from justice from the State of Georgia, is now residing in the District of Saint Charles. His Neighbors with a view to rid their Society of one covered with crimes, would cheerfully deliver him for trial if duly authorized to do so…E. Hempstead"; mall bit of erosion along fold affects rating, F.-V.F., ex-Alexander. (Louisiana Territory) "St. Louis, Jany 24", manuscript postmark on folded letter datelined "Fort Osage, 1st Jany. 1811" to Detroit Mich. with "Public Service, J. Brownson" endorsement, carried down the Missouri River and entered mails with manuscript "St. Louis Jany 24" postmark over "3/4 oz" notation and "75" rating at right, letter contains quarterly returns of a company of the First Infantry Regiment that was stationed at the fort, in a postscript the writer says "6 of our Osage Indians have been lately killed by a party of Pawtowatomies"; some light soiling, Very Fine, ex-Alexander. A SCARCE FORT OSAGE, LOUISIANA TERRITORY USE VIA ST. LOUIS TO DETROIT MICH. Following a treaty with the Osage Indians on November 10, 1808 Fort Osage was built on the big eddy of the Missouri River on a bluff 70 feet high near the present site of Sibley, Jackson County, Missouri. It replaced Fort Belle Fontaine as an Indian trading post and soon became the most important post in the United States. It was evacuated during the War of 1812 (in 1813), but the garrison returned in 1815. Troops were withdrawn in 1819 at the time of the Yellowstone Expedition, when the garrison was moved to Fort Atkinson at Old Council Bluffs. The fur trading operations were shut down in 1822 when the Indian Factory System was terminated, but the post was not abandoned until 1827, when Fort Leavenworth was built to protect the Santa Fe Trail. George C. Sibley was the factor at Fort Osage during its entire existence as a trading post. He later founded the town of Sibley, Missouri near the abandoned fort.